Population Ranked 6th in the U.S. The Commonwealth of Pennsylvania is a state located in the Middle Atlantic region of the United States of America. One of Pennsylvania's nicknames is the Quaker State; in colonial times, it was known officially as the Quaker Province, in recognition of Quaker William Penn's First Frame of Government constitution for Pennsylvania that guaranteed liberty of conscience. Penn knew of the hostility Quakers faced when they opposed swearing oaths, warfare, and violence. Pennsylvania has 51 miles (82 kilometers) of coastline along Lake Erie and 57 miles (92 km) of shoreline along the Delaware Estuary. Philadelphia is Pennsylvania's largest city and is home to a major seaport and shipyards on the Delaware River. William Penn founded the Province of Pennsylvania as a British North American colony on land he had been granted by King Charles II of England, as repayment of a debt to Penn's father. Penn called the area Sylvania (Latin for woods), which Charles changed to Pennsylvania in honor of the elder Penn. This province eventually became the current state of Pennsylvania. 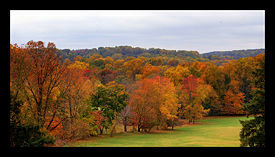 Autumn colors in Bryn Athyn, PA.
Pennsylvania's nickname, the Keystone State, is quite apt, because the state forms a geographic bridge both between the Northeastern states and the Southern states, and between the Atlantic seaboard and the Midwest. 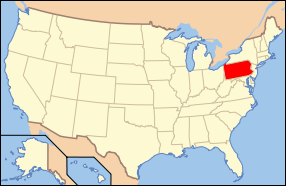 It is bordered on the north and northeast by New York; on the east, across the Delaware River by New Jersey; on the south by Delaware, Maryland, and West Virginia; on the west by Ohio; and on the northwest by Lake Erie. The Delaware, Susquehanna, Monongahela, Allegheny, and Ohio Rivers are the major rivers of the state. The Youghiogheny River and Oil Creek are smaller rivers which have played an important role in the development of the state. Pennsylvania is 170 miles (274 km) north to south and 283 miles (455 km) east to west. Of a total 46055 sq mi (119,282 sq km), 44817 sq mi (116,075 sq km) are land, 490 sq mi (1,269 sq km) are inland waters and 749 sq mi (1,940 sq km) are waters in Lake Erie. It is the 33rd largest state in the United States. The highest elevation at 3213 feet above sea level (979 meters), at Mount Davis, named for its owner, John Davis, a schoolteacher who fought for the Union Army at the Battle of Gettysburg. The lowest point is sea level, on the Delaware River. The approximate mean elevation is 1100 ft (335 m). The Appalachian Mountains cut diagonally across the state from northeast to southwest. The western part of the state is underlain by sedimentary rock, rich in deposits of bituminous coal. Central Pennsylvania is the anthracite coal region, with the characteristic anticline-syncline topography of tightly folded sedimentary layers. The eastern third of the state is a product of ocean formation and orogenesis, and is marked by igneous and metamorphic rock close to a billion years old in some areas. The southern boundary of Pennsylvania was originally fixed at 40° north latitude, but as a result of a bad faith compromise by Lord Baltimore during Cresap's War, the boundary was moved 20 miles (32 km) south to 39° 43' N, at the Mason-Dixon Line. The city of Philadelphia would have been split in half by the original boundary. Pennsylvania has three general climate regions, which is determined by altitude more than latitude or distance from the oceans. Most of the state falls in the humid continental climate zone. The lower elevations, including most of the major cities, have a moderate continental climate, with cool to cold winters and hot, humid summers. 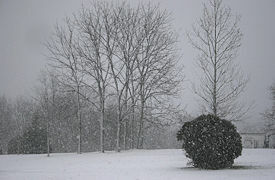 Highland areas have a more severe continental climate with warm, humid summers and cold, more severe and snowy winters. Extreme southeastern Pennsylvania, around Philadelphia, borders into a humid subtropical climate with milder winters and hot, humid summers. Before white settlement in what was to become Pennsylvania, the area was home to the Delaware (also known as Lenni Lenape), Susquehannock, Iroquois, Erie, Shawnee, and other Native American tribes. The groups were scattered and small in number. The Delaware River watershed was claimed by the British based on the explorations of John Cabot in 1497, Captain John Smith and others, and was named for Thomas West, 3rd Baron De La Warr, the Governor of Virginia from 1610 until 1618. At that time the area was considered to be part of the Virginia colony. However, the Dutch thought they also had a claim, based on the 1609 explorations of Henry Hudson, and under the auspices of the Dutch West India Company were the first Europeans to actually occupy the land. They established trading posts in 1624 at Burlington Island, opposite Bristol, Pennsylvania, and then in 1626 at Fort Nassau, now Gloucester City, New Jersey. Peter Minuit was the Dutch Director-General during this period and probably spent some time at the Burlington Island post, thereby familiarizing himself with the region. By 1644 Swedish and Finnish settlers were living along the western side of Delaware River from Fort Christina to the Schuylkill River. New Sweden's best known governor, Johan Björnsson Printz, moved his residence to what is now Tinicum Township, Pennsylvania, nearer to the center of the settlements. The Dutch never gave up their claim to the area, however, and once they had some vigorous military leadership under Peter Stuyvesant, they attacked the Swedish communities and in 1655 reincorporated the area back into the New Netherlands colony. It was not long, though, before the Dutch as well were forcibly removed by the British, asserting their earlier claim. In 1664, James, the Duke of York, and brother of King Charles II, outfitted an expedition that easily ousted the Dutch from both the Delaware and Hudson Rivers, leaving the Duke of York the proprietary authority in the entire area. In 1681, Charles II of England granted a land charter to William Penn, to repay a large debt owed to William's father, Admiral Penn. This was one of the largest land grants to an individual in history. The land included present-day Delaware and Pennsylvania. Penn then founded a colony there as a place of religious freedom for Quakers, and named it for the Latin sylvania meaning "Penn's woods." 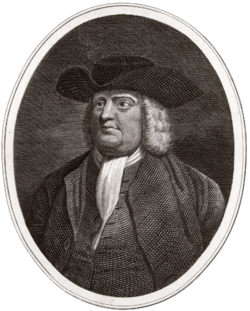 In keeping with his deeply held Quaker beliefs, William Penn pursued amicable relations with the Native Americans then living in the area, including negotiating contracts with them to purchase any lands of theirs that had been included in the King's grant. 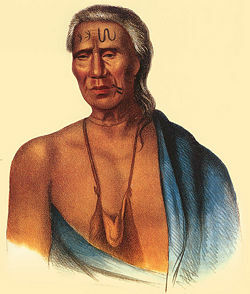 Tamanend, a Lenni-Lenape chief, played a prominent role in peaceful relations between Native tribes and white settlers in Pennsylvania during this time. Memorialized on a statue of Tamanend that stands in Philadelphia are these words he reportedly used in his negotiations with Penn and his leadership: (We will) "live in peace as long as the waters run in the rivers and creeks and as long as the stars and moon endure." The colony's reputation of religious freedom also attracted significant populations of German and Scots-Irish settlers who helped to shape colonial Pennsylvania and later went on to populate the neighboring states further west. Penn established a government with two innovations that were much copied in the New World: the county commission, a new model of small-scale self-governance, and freedom of religious conviction. Writer Murray Rothbard in his four-volume history of the U.S., Conceived in Liberty, refers to the years of 1681–1690 as "Pennsylvania's Anarchist Experiment." Most of Pennsylvania's residents generally supported the protests and dismay common to all 13 colonies after the Proclamation of 1763 and the Stamp Act. Pennsylvanians originally supported the idea of common action, and sent delegates to the Stamp Act Congress in 1765. 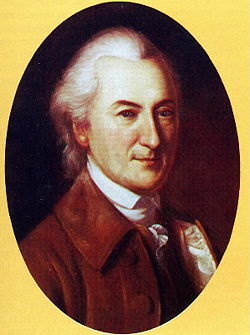 After the Stamp Act Congress of 1765, Delegate John Dickinson of Philadelphia, Pennsylvania wrote the Declaration of Rights and Grievances. That Congress was the first meeting of the thirteen colonies, called at the request of the Massachusetts Assembly, but only nine colonies sent delegates. Dickinson then wrote "Letters from a Farmer in Pennsylvania, To the Inhabitants of the British Colonies," which were published in the Pennsylvania Chronicle between December 2, 1767, and February 15, 1768. Pennsylvania, and particularly Philadelphia, played a key role in the forming of what was to become the United States, then referred to as the United Colonies of America. When the Founding Fathers of the United States were to convene in Philadelphia in 1774, 12 colonies sent representatives to the First Continental Congress. The First Continental Congress drew up and signed the Declaration of Independence in Philadelphia, but when that city was captured by the British, the Continental Congress escaped westward, meeting at the Lancaster courthouse on Saturday, September 27, 1777, and then to York. There they drew up the Articles of Confederation that formed 13 independent colonies into a new nation. Later, the Constitution was written, and Philadelphia was once again chosen to be cradle to the new American Nation. Pennsylvania became the second state to ratify the U.S. Constitution on December 12, 1787, five days after Delaware became the first. Pennsylvania, bordering the south, played an important role in the operation of the Underground Railroad prior to the Civil War. The term "Underground Railroad" is believed to have been coined by a disgruntled Southerner who believed only some sort of "underground railroad" could account for the disappearance of so many escaped slaves upon reaching Columbia, PA, just 20 miles from the border with Maryland. Pennsylvania's Quaker beginnings led to the earliest anti-slavery movement in the colonies; in 1780, the Pennsylvania Gradual Abolition Act was the first law passed in the US for emancipation. Pennsylvania was the target of several raids by the Confederate States Army, including cavalry raids in 1862 and 1863 by J.E.B. Stuart, in 1863 by John Imboden, and in 1864 by John McCausland in which his troopers burned the city of Chambersburg. Pennsylvania also saw the Battle of Gettysburg, near Gettysburg. Many historians consider this battle the major turning point of the American Civil War. The fallen soldiers from this battle rest at Gettysburg National Cemetery, site of Abraham Lincoln's Gettysburg Address. A number of smaller engagements were also fought in Pennsylvania, including the Battle of Hanover, Battle of Carlisle, Battle of Hunterstown, and the Battle of Fairfield, all during the Gettysburg Campaign. Harrisburg is Pennsylvania's capital city. The population of the city itself had a population of only 48,950 at the time of the 2000 census, though its metropolitan area had a total population of 643,820, making it the fifth most populous metropolitan area in Pennsylvania, after Philadelphia, Pittsburgh, Allentown-Bethlehem-Easton, and Scranton-Wilkes-Barre. It is the county seat of Dauphin County and lies on the east bank of the Susquehanna River, 105 miles (169 km) west-northwest of Philadelphia. Harrisburg has played a critical role in American history during the Westward Migration, the American Civil War, and the Industrial Revolution. During part of the nineteenth century, the building of the Pennsylvania Canal and later the Pennsylvania Railroad, allowed Harrisburg to become one of the most industrialized cities in the Northeastern United States. The dome of the State Capitol building was inspired by the domes of Saint Peter's Basilica in Rome and the United States Capitol. President Theodore Roosevelt called it the "the most beautiful state Capitol in the nation," and said "It's the handsomest building I ever saw" at the dedication. In 1989, the New York Times praised it as "grand, even awesome at moments, but it is also a working building, accessible to citizens … a building that connects with the reality of daily life." Pennsylvania has had five constitutions during its statehood: 1776, 1790, 1838, 1874, and 1968. Prior to that, the province of Pennsylvania was governed for a century by a Frame of Government, of which there were four versions: 1682, 1683, 1696, and 1701. The Executive Branch is made up of the Governor, the Lieutenant Governor, Attorney General, Auditor, and State Treasurer—all elected officials. Pennsylvania has a bicameral legislature set up by state's constitution in 1790. The original Frame of Government of William Penn had a unicameral legislature. The General Assembly includes 50 Senators and 203 Representatives. The 2006 election resulted in the Democrats regaining control of the House and the Republicans' retaining control of the Senate. Pennsylvania is divided into 60 judicial districts, most of which (except Philadelphia and Allegheny Counties) have magisterial district judges (formerly called district justices and justices of the peace), who preside mainly over minor criminal offenses and small civil claims. Most criminal and civil cases originate in the Courts of Common Pleas, which also serve as appellate courts to the district judges and for local agency decisions. The Superior Court hears all appeals from the Courts of Common Pleas not expressly designated to the Commonwealth Court or Supreme Court. It also has original jurisdiction to review warrants for wiretap surveillance. The Commonwealth Court is limited to appeals from final orders of certain state agencies and certain designated cases from the Courts of Common Pleas. The Supreme Court of Pennsylvania is the final appellate court. All judges in Pennsylvania are elected; the Chief Justice is determined by seniority. Pennsylvania is represented in the US Congress by two Senators and 19 Representatives. In the past decade, no political party has been clearly dominant in Pennsylvania. This, combined with Pennsylvania's rank of sixth in the country in population, has made it one of the most important swing states electorally. Democrats are strong in urban Republicans are generally dominant in the vast rural areas that make up the balance of the state. Traditionally, Republicans have also fared well in the densely populated and wealthy suburbs of Philadelphia and Pittsburgh, but in the 1990s and 2000s these suburbs trended Democratic. Pennsylvania's 2005 total gross state product (GSP) of $430.31 billion ranks the state 6th in the nation. If Pennsylvania were an independent country, its economy would rank as the 17th largest in the world, ahead of Belgium, but behind the Netherlands. Pennsylvania's per-capita GSP of $34,619 ranks 26th among the 50 states. Philadelphia in the southeast corner and Pittsburgh in the southwest corner are urban manufacturing centers, with the "t-shaped" remainder of the state being much more rural; this dichotomy affects state politics as well as the state economy. Pittsburgh is home to six Fortune 500 companies, including U.S. Steel, PPG Industries, H.J. Heinz, and Alcoa. In all, Pennsylvania is home to 49 Fortune 500 companies. Pennsylvania's factories and workshops manufacture 16.1 percent of the Gross State Product (GSP); only ten states are more industrialized. Metal products, chemicals, transportation equipment, machinery, glass and plastic products are the major industrial outputs. While Educational Services is only 1.8 percent of the state's GSP, that's twice the national average; only Massachusetts, Rhode Island and Vermont outrank Pennsylvania. Although Pennsylvania is known as a coal state, mining only amounts to 0.6 percent of the state's economy, compared to 1.3 percent for the country as a whole. 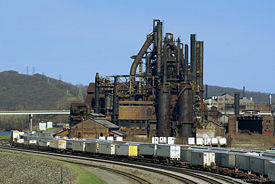 Once the leading producer of steel in the nineteenth and twentieth centuries, Pennsylvania's steel industry has declined significantly. Pennsylvania remains an important source of coal, petroleum and natural gas. A small subsector of manufacturing that flourishes in Pennsylvania is specialty foods production. According to Pennsylvania Snacks: A Guide to Food Factory Tours, author Sharon Hernes Silverman calls Pennsylvania the "snack food capital of the world." It leads all other states in the manufacture of pretzels and potato chips. The US chocolate industry is centered in Hershey, Pennsylvania, with Mars and Wilbur Chocolate Company nearby. Other notable companies include Just Born in Bethlehem, PA, makers of Hot Tamales, Mike and Ikes, and the Easter favorite marshmallow Peeps, Benzel's Pretzels and Boyer Candies of Altoona, PA, which is well known for its Mallow Cups. Auntie Anne's Pretzels originated in Gap, but their corporate headquarters is now located in Lancaster, PA.
Pennsylvania is an important source of food products. It ranks 19th overall in agricultural production, but first in mushrooms, third in Christmas trees and laying chickens, fourth in nursery and sod, milk, corn for silage, and horse production. Only about 9,600 of the state's 58,000 farmers have sales of $100,000 or more, and with production expenses equaling 84.9 percent of sales, most have a net farming income below the $19,806 that marks poverty for a family of four, and that does not reflect the 12.4 percent self-employment tax as well. The farming population is aging; the average farmer is 53. Many farms in the southeastern part of the state have been sold to housing developers in the past years. This is largely due to rising taxes and land prices, reflecting high demand for land in the nation's fifth largest metropolitan area. Bucks and Montgomery counties were the first to suburbanize, but this trend is now extending to Chester, Lancaster, Berks, and Lehigh counties. 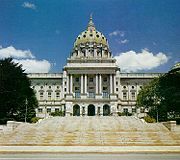 The state government launched an extensive tourism campaign in 2003 under the direction of the Pennsylvania Department of Community and Economic Development. An extensive website VisitPA, has been established to promote visits to the state. Pennsylvania draws 2.1 percent of the Gross State Product from accommodation and food services. In contrast, only Connecticut, Delaware, and Iowa have lower numbers. Philadelphia draws tourists to see the Liberty Bell, Independence Hall, the Franklin Institute, and "Rocky Steps" of the Philadelphia Museum of Art, while the Poconos attract honeymooners, golfers and fishermen. The Delaware Water Gap and Allegheny National Forest appeal to boaters, hikers, and nature lovers. Fourteen slots casinos, the majority of which are either in the process of being awarded licenses from the Pennsylvania Gaming Control Board or are under construction, are expected to make up a good portion of tourism in the Commonwealth. The Pennsylvania Dutch region in south-central Pennsylvania is a favorite for sightseers. 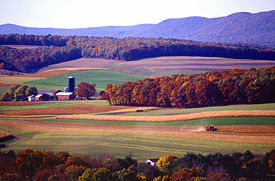 The Pennsylvania Dutch, including the Old Order Amish, the Old Order Mennonites and at least 35 other sects, are common in the rural areas around the cities of Lancaster, York, and Harrisburg, with smaller numbers extending northeast to the Lehigh Valley and up the Susquehanna River valley. Pennsylvania is home to the nation's first zoo, the Philadelphia Zoo. The state boasts some of the finest museums in the country. One of the unique museums is the Houdini Museum, the only one in the world devoted to the legendary magician. It is also home to the National Aviary, located in Pittsburgh. Pennsylvania offers a number of notable, and historically significant, amusement parks, including Dutch Wonderland, Idlewild Park, and Kennywood Park in Pittsburgh. Hunting is popular in the state. There are nearly 1 million licensed hunters. Whitetail deer, cottontail rabbits, squirrel, turkey, and grouse are common game species. Sport hunting in Pennsylvania is a massive boost for the state economy. A report from The Center for Rural Pennsylvania (a legislative agency of the Pennsylvania General Assembly) reported that hunting, fishing, and trapping generated a total of $9.6 billion statewide. In 1837, a Departement of Schools was created; in 1873, the name was changed to Department of Public Instruction. In 1969, a state Department of Education was formed, with a state Secretary of Education as its head. School Districts in Pennsylvania are subdivided into 29 Intermediate units. Pennsylvania re-organized its higher education into the Pennsylvania State University system, with the State College campus as the flagship. There are 130 colleges and universities and 323 private legally authorized to grant degrees. These provide a wide array of choices with options ranging from two-year specialized technical colleges, private two-year colleges, community colleges and seminaries to doctoral and professional degree-granting institutions. The University of Pennsylvania in Philadelphia includes the famous Wharton School of Business, founded on the principles of Benjamin Franklin, is a private university, as is Carnegie Mellon in Pittsburgh. As of 2006, Pennsylvania had an estimated population of 12,440,621, which is an increase of 35,273 from the previous year, and an increase of 159,567 since the year 2000. Five percent of the population had come from other countries. Foreign-born Pennsylvanians are largely from Asia (36.0 percent), Europe (35.9 percent), Latin America (30.6 percent), 5 percent coming from Africa, 3.1 percent coming from North America, and 0.4 percent coming from Oceania. The five largest ancestry groups self-reported in Pennsylvania are: German (27.66 percent), Irish (17.66 percent), Italian (12.82 percent), English (8.89 percent) and Polish (7.23 percent). 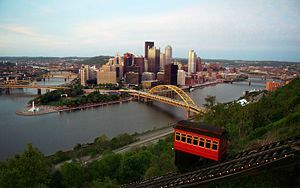 The skyline of Pittsburgh, the 20th-largest metropolitan area in the United States. Of all the colonies, only in Rhode Island was religious freedom so secure as in Pennsylvania - and one result was an incredible religious diversity that continues to this day. Pennsylvania is noted for having the highest concentration of an Amish population in the United States. Although Pennsylvania owes its existence to Quakers and many of the older institutions of the state are rooted in the teachings of the Religious Society of Friends (as they are officially known), practicing Quakers are a small minority today. Municipalities in Pennsylvania are incorporated as cities, boroughs, or townships. The ten most populous cities in Pennsylvania are, in order: Philadelphia, Pittsburgh, Allentown, Erie, Reading, Scranton, Bethlehem, Lancaster, Harrisburg, and Altoona. The skyline of Philadelphia, the largest city in Pennsylvania and the sixth-largest metropolitan area in the United States. ↑ Pennsylvania – Languages. Advameg, Inc.. Retrieved February 18, 2012. ↑ Andy Gotlieb, Tragedy of 9/11 pummels insurance industry. January 4, 2002. American City Business Journals. Retrieved December 1, 2007. ↑ Pennsylvania Department of Education. Colleges and universities Retrieved December 1, 2007. Components of Population Change for the United States. Census.Gov. Retrieved November 21, 2007. Pennsylvania Fact Sheet. U.S. Census Bureau. Retrieved November 21, 2007. American Community Service 2003 Multi-Year Profile Pennsylvania. U.S. Census Bureau. Retrieved November 21, 2007. State Membership Report. Association of Religion Data Archives. Retrieved November 21, 2007. Gross State Product by Selected Major NAICS Sectors as a Percent of State GSP Total in 2005. Northeast Midwest Institute. Retrieved November 21, 2007. Poverty Thresholds of 2005. Census.Gov. Retrieved November 21, 2007. Population and Population Centers by State in 2000. Census.Gov. Retrieved November 21, 2007. United States Geological Survey. Science In Your Backyard: Pennsylvania. This page was last modified on 4 February 2019, at 01:26.